Heavy rain and flooding forced the State Fair of Texas to close early Monday night. It’s a situation fair officials said won’t happen again during the duration of its 2018 run. One family, who are new to Texas, braved Tuesday’s rainy and cold conditions because they wanted to experience the fair. “We just moved from Colorado. We’ve heard a lot about the fair and wanted to come. The weather doesn’t really affect me much,” said the patron. 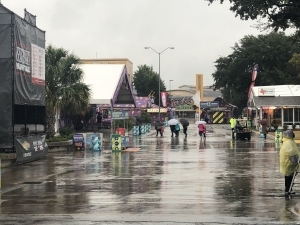 The State Fair of Texas’ Karissa Condoianis said she’s hoping more North Texans will follow suit and enjoy the festivities despite the rainy weather. “Our hope is that this starts to clear out after today so we can end the fair strong because we don’t have that many days left of the 2018 fair and we don’t have the option to extend,” she said. Last year, the fair welcomed 2.2 million visitors and made $54.5 million in coupon sales. Condoianis said both officials and vendors are hoping the bleak weather conditions will pull a 180 and clear up. “It is Texas…you know, one day it can be in the eighties and then apparently it can be in the forties,” she said.